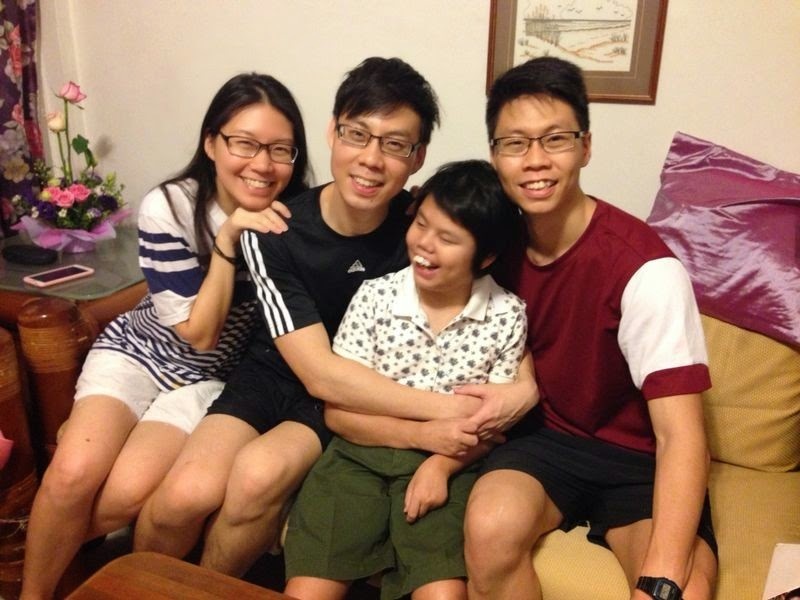 Hi everyone, I am Swee Luan, a mother of 4, & today I would like to share with you my testimony concerning my youngest daughter who is a special needs child. I pray that this sharing will be an encouragement to all mothers & mothers-to-be. Faith was born 17 years ago. When I was 28 weeks pregnant with her, the doctor discovered some abnormalities during the routine ultrasound scan of the foetus. After more detailed scans it was confirmed that she had hydrocephalus, which is water in the brain. At that time, her heart was also enlarged and the gynaecologist had to prepare us mentally that she might die in the womb. Though there was some anxiety and fear upon learning the news, I thank God that I am a Christian & that I had the confidence & trust in my God that He is still on the throne and in control. This peace & faith in my heart helped me to go through that day with calmness & my husband & I were able to discuss the steps needed to be taken & the possible prognosis of the child’s condition if she should survive. The neurosurgeon’s advice was solicited & we were instructed to monitor the pressure of the water built up in the brain. Twice weekly visits to the doctor’s for scans finally confirmed that the baby had to be delivered as soon as possible when the water pressure against the brain cortex left a mere margin of less than 8mm. Thankfully at that time the baby’s weight had also increased sufficiently for delivery. Throughout those few weeks of waiting, the Lord was with us. As a mother, feelings of guilt & reproach were strong even as I blamed myself for this problem: “Was I too careless with my health? Did I do too much strenuous work? Was it when I squatted too low & long when cleaning the floors? Was there any unconfessed sin? Is it chastisement for some unrepentant sin within me?” These awful thoughts made me search my heart before the Lord. Oh those long nights were dreary & tears flowed, but My God was with me, He comforted & cleansed me with His words & lifted me up with His songs. His Word, especially the psalms was never before so personal and alive, & the voice of my Saviour so clear & sweet, giving me the joy and confidence to receive this good & perfect gift from above, that cometh down from the Father of lights. My 3 other children were only 9, 6 & 5 then. They were like my angels comforting & assuring me that God would look after their sister. We had been praying together every night for their new sibling, & when my husband & I shared with them the problem she was having, each of them prayed simply & earnestly that God would save their sister & remove the water from her brain. Their childlike faith & trust in God really taught me that except we be like a child, we’d never see the kingdom of God. The next lap was even more trying. It was truly a time when the storm blew the hardest. We were like creepers clinging on & pressing hard against the tree. Faith was operated on the 3rd day after delivery & our God was with our baby. Even the surgeon was surprised by her strength. The surgery was complicated as her head was so tiny. The doctor decided to try removing the 2 blockages in her brain by piercing through the hardened tissues. The pressure was released & she remained stable for a week, but very quickly, it was observed that pressure was beginning to build up again. It was too soon to operate again, so with mixed feelings we brought her home after she had her post-op infection cleared. She was by then a month old. Her head was swollen & I thought she looked like a creature from outer space. But again the children taught me a precious lesson: their joy at having their sister home & shouts of exclamation of how cute she was really put me to shame. They even kept insisting I remove her cap when taking photos because they didn’t see why I thought her head was ugly. Their total & unconditional acceptance of their special sister gave me much strength & assurance & taught me to remove my own prejudices even as the Lord accepts us as we are when we come to Him. After a month at home, Faith started vomitting & her eyeballs began to sink below her lids such that only about half or less of her eyeballs could be seen. Those are called sunset eyes. Her fontanelles were bulging & hard, which was another symptom of pressure. The doctor had to do an emergency operation to insert a shunt which is a straw-like tube to channel the water from her brain to her abdomen into her peritoneal cavity. Even as we learnt of this technology that was recently invented in the 1940’s, we knew it was God’s mercy & will that she should live to show forth His praise & glory. The major risk for any invasive surgery is infection & we pleaded for the Lord’s mercy to be upon her. However, the Lord’s reply to our prayers was in the negative. She contracted bacterial meningitis a month after her shunt insertion & was again warded for treatment. God’s answer to us reminded us of how Apostle Paul having pleaded for the thorn in the flesh to be removed, received God’s negative answer ever so gently when God said in 2 Cor 12:9 (KJV), “My grace is sufficient for thee; for my strength is made perfect in weakness.” Faith’s infection worsened the prognosis of her condition when one morning the neurosurgeon explained that this episode would affect not only her physical but mental development as well. That 34-day hospital stay with her saw our baby badly bruised on her arms, legs & even head as doctors searched tirelessly for a usable vein in her tiny body to allow the antibiotics to be given intravenously to combat the bacteria ravaging her brain. The strong medicine burnt each vein barely after a couple of days’ doses, & so delayed the necessary prompt treatment. She had to have her shunt revised twice during that time as it became blocked with the dead cells of the bacteria. She also suffered a stroke & it affected her left limbs & eye. Because of her illness, she also suffered severe hearing loss. This traumatic episode really brought me so low & helpless that I fully comprehended the psalmist when he says, “It is better to trust in the Lord than to put confidence in man, It is better to trust in the Lord than to put confidence in princes.” (Psalm 118:8-9 KJV). Praying & praising the Lord using the psalms became my powerline. If not for God’s Grace & Hand upon me, I believe I would have gone insane with post-natal depression. Faith’s hospital stay actually became a blessed time of witnessing to other parents in the ward, a testimony to fellow believers especially the nurses & some young ward doctors who appreciated the complications of Faith’s medical condition & had often commented, “You’re very blessed mummy. God is with you.” I was reminded by Job when he said, “What? shall we receive good at the hand of God, & shall we not receive evil? In all this Job did not sin with his lips”. (Job 2:10 KJV) With the meningitis over, we brought our daughter home to recuperate, but she had become very unresponsive by then. 2 months later, she had her 1st seizure when I was alone with her. Watching her shaking in spasms uncontrollably did frighten me badly. I cried & called on the Lord’s mercies, the fits stopped after several minutes & the Lord returned her breath to her. God has said in Psalm 50:15 KJV, “Call upon me in the day of trouble: I will deliver thee, & thou shalt glorify me.” Faith was later diagnosed with a condition known as West Syndrome. It was an uphill task just to find the right cocktail of drugs to stabilize her seizures which were occurring numerous times a day. That took us more than a year & we were contented when her seizures finally dropped to just a few times a day. But the Lord has His ways & His time when miraculously, she had only one seizure the very day she turned 7! & it was just a mild one. Ever since then, she’s been having only about 1 seizure in 3 months. All praise & glory to God. Her dedicated & patient neurologist who has been with her the past 12 years, gave the biggest smile I’ve ever seen on her face. We knew it was the Lord’s doing. Faith has been growing & developing steadily; her left limbs stiffened & weakened by the stroke have become stronger through the years of physiotherapy & swimming. She swims better than mummy and daddy now! The Lord enabled her to use whatever residual hearing to enjoy her tape recordings of bible songs. She has cortical blindness which means her perception of images is not interpreted too well for her, but the Lord enabled her to watch & enjoy her favourite Action Bible Songs VCD on the TV & she’s now able to see & recognise her family members whom she loves. She has been our blessing & a joy to care for. Her needs are simple & she is undemanding even as she trusts us to meet her needs. Though she cannot talk, she can utter a loud resounding “ YA” which is such a cheer to us. She has open doors for us to share with other families who have children or family members with special needs. Even strangers & taxi drivers open up to us easily when we are with her. We’ve met wise mothers, whose curious children have stared at her as a big girl still in a pram, who smiled at us & made their children call her “jie jie” & so began a simple greeting between us as well as embarrassed mothers who whispered fiercely to their children & pulled their bewildered children away. A young son of our friends came to us once & asked innocently if Faith was mad. I was glad for the opportunity to share her condition briefly & requested him to remember to pray for her. He left cheerfully with his promise to pray. Our Little Faith has indeed taught us invaluable lessons especially of God’s power, grace, patience & love for us. She has made us better parents, grandparents, sister & brothers. She has bonded our family closer as each of us, having experienced the fragility of her life, treasures & appreciates one another more deeply. God has never failed her & so taught us neither would He fail any of us, His precious children, bought & redeemed by the blood of His only begotten Son. In her childlike ways she has taught us the simplicity of life which is simply trusting Jesus every day, trusting Him through the stormy way, even when our faith is small, trusting Jesus that is all. Our hope is built on nothing less but Jesus Christ the Lord. It’s not positive thinking nor resigning to fate; it’s not a false cheerful front but a true hope in our living & true God that our handicapped child will be well one day when we all see our Blessed Saviour, Our Lord Jesus Christ face to face. This is my testimony of the struggles and joys of a mother of a special needs child. May God who has helped me & my family all these years be your Help & Strength too. God bless. 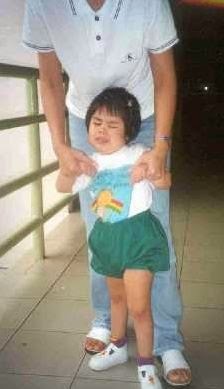 This is Faith when she was about 4YO. We entrusted God to enable her to learn to walk. We trust our God to bless all who have been praying together with us in this matter. He has so graciously helped our little Faith to take her steps with support. Indeed, it is a milestone in her development. It has been a tearful struggle for her. Wails of her protest as we walk her was a test of our patience and endurance. By His grace, we are strengthened & so was Faith. The last 2 months saw Faith taking her steps quite cheerfully. Though she is not able to walk independently yet, we shall wait upon the Lord. * Swee Luan is the wife of Rev. Tan Kian Sing, pastor of Berean Bible-Presbyterian Church.